The Xantrex PROwatt SW Series feature True Sine-Wave AC output with 600, 1000 and 2000 watts respectively. With high surge capability, the Xantrex PROwatt SW Series provides the necessary current to startup demanding electrical loads such as variable speed power tools, advanced electrical appliances, microwaves and much more. In addition to dual GFCI AC receptacles, the Xantrex PROwatt SW Series include an innovative USB connection for providing power to most USB chargeable devices. 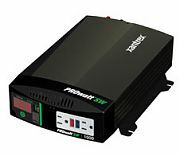 The Xantrex PROwatt SW Series offers many safety features not found in similar inverters. When equipped with a remote control, the Xantrex PROwatt SW Series has the ability to provide automatic ignition lockout shutting down the inverter’s output when the vehicle’s ignition is not engaged. The compact, easy-to-use and easy-to-install design of the Xantrex PROwatt SW Series makes it ideal for use in commercial truck, RV and marine applications. The compact, easy-to-use and easy-to-install design of the Xantrex PROwatt SW Series makes it ideal for use in commercial truck, RV and marine applications. With True Sine-Wave output, the Xantrex PROwatt SW Series can provide power for all types of electrical loads including, variable speed power tools, advanced electrical appliances, microwaves and much more. The Xantrex PROwatt SW provides household AC power anywhere.